Started a new job with little gilt of retiring my SAHM status...until now. The first week of October the decision was official that I was going back to work full time. The third week of October I started my new career. It happened quicker than anticipated but everything happens for a reason, right? Many stated it was going to be hard leaving B everyday with my father in law. NOPE. I thought I was going to be upset, cry, want to go home but within the first 15 minutes of being at my new office I fell back into career mode and 9 hours flew by without a hint of sadness. Guilt, yes. I felt guilty that I didn't feel bad. Yesterday I stayed home sick, both me and B have a killer of a cold. Yesterday the separation pain hit me. B woke and immediately fell into our old routine. She even requested to do lessons all day! AND SHE DID THEM! Throughout the day she stated she was glad I was on vacation (aka death's sick door). It hurt deep down in my soul. My mommy role is so much stronger than worker role. Obesity has become a common problem in America today. The reason for this is that parents and kids are unaware about nutritional eating, kids get too much sugar and they are too addicted to fast food. The common misconception is that fast food joints are cheaper and quicker. But in trying to save a few minutes, you are filling your bodies, and those of your kids, with transfats which metabolize into human fat and cold drinks which only make you thirstier and slowly remove the calcium from your bodies. One third of the child population in America is pre-diabetic and adults and kids alike complain of fatigue and exhaustion very often. This is the result of bad and unhealthy eating. There are many movies which could teach people about the benefits of healthy eating and detriments of unhealthy food. Two popular ones which come to mind are Supersize Me and Food Inc.
My household is one that strictly eats organic foods. My wife, Crystal, grew up eating home grown food on her farm in Idaho. She actually couldn’t believe that that’s not the way everybody eats. She’s the nutrition guru of my home and she gets us and the grandkids together to cook some of our meals. Not only do we get some great family memories and recordings, we get to eat healthy food and our grandkids learn the value of nutritional eating too. I am often complimented on how young I look. I feel young too. After all, I give my body healthy food which helps it stay young and healthy. If you stuff your body with unhealthy food, it will become tired and leave you unable to do all that you want to. That is the reason for the fatigue rampant in people today. And it’s not that fast food is cheaper. You can get a full healthy meal for four people at a swap meet in under a dollar! The point is that what you eat and feed your kids today will determine how much energy and capability they have tomorrow. Your kids have dreams that require hard work. Imbibe nutritional eating in their lifestyles so that they grow up healthy and are able to carry out the tasks they will need to in order to achieve their dreams. Mark Victor Hansen is an American inspirational and motivational speaker, trainer, and author. He is best known a the founder and co-creator of the "Chicken Soup for the Soul" book series. Looking to spice dinner up a bit? Want something Autumny to serve to your family? Tweak a recipe you love with an international ingredient and experience the magic. You can find international grocery staples now at Dominick's so don't fret about finding the nearest Italian Import or Polish Deli; you can create international locally! Pasta. We associate it immediately as Italian, but did you know that Greeks love their pasta too? What I found to be the distinguishing factor is the seasoning in the sauce. Cinnamon. Yep, cinnamon in the tomato sauce takes it south of the boot. Here is a quick and easy Greek Tomato Sauce that sends the scent of Autumn throughout your kitchen! In a large pot sweat the onion and garlic in olive oil, about 5 minutes on medium heat. Add tomatoes and seasonings. Stir. Bring to boil for 5 minutes then reduce to low. Let simmer for about 30 minutes. Add sugar, 1 tsp at a time and adjust to taste. I like my sauces less acidic and sweet, 3 tsp will get it there. Let simmer another 30 minutes. Stir frequently. Add salt and pepper to taste. Cook your Racconto pasta according to directions on package. Remove bay leaf from sauce and serve over the pasta. This is a great base for other ingredients. Add meat if you like meat sauce. Have a bounty of peppers or spinach from your garden? Add those too. In a saucepan bring to boil the apple juice and balsamic vinegar. Add sugar and cloves, turn heat down to medium and simmer until reduced by about 1/2. It will thicken a bit but not much. Should yield about 1/2 cup. Heat oven to 325 degrees. Place pork loin in a baking dish. Pour reduction over the the pork loin, cover dish with foil and bake for 35 minutes. Pour the apple-vinegar sauce mixed with meat juices back in sauce pan. Bring to hard boil and reduce til syrupy. Pour half on pork loin, place back in oven and cook for another 10 minutes. Use a meat thermometer to make sure the pork is cooked through to 170 degrees. Slice and plate pork. Drizzle remaining reduction over the slices or to the side for dipping. Not feeling Greek or Polish? Well, Dominick's has over 1000 new international items with great everyday prices including Italian, Polish, Hispanic, German, Kosher, Irish, Asian, and Middle Eastern. Next on my shopping list? German Spaetzle! Auf Wiedersehen. Want to win a $50 Dominick's Gift Card to try out some new international items? SIMPLE, just Tweet me about your favorite international ingredient. A winner will be chosen Sunday evening! *I was provided a Gift Card to purchase ingredients needed for my recipe creations. Happy National Vodka Day! 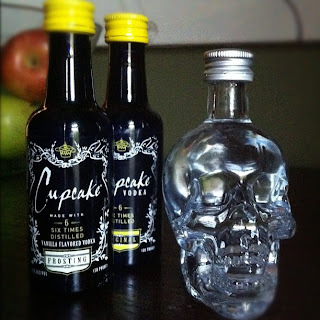 Today I am ringing in the holiday by imbibing some delicious spirits, Crystal Head Vodka and Cupcake Vodka. Crystal Head Vodka not only comes packaged in the most awesome crystal skull bottle, but is delicious. I got all giggly when I popped open the bottle and took a smell--nothing! The first sip was strong on the tongue but immediately faded, making for a perfect vodka to drink all night long, no mixer needed. Crystal Head and Water is my new drink of choice...so long GG & K1! Well, I can't stop at just one vodka on National Vodka Day so next up is Cupcake Vodka. Two blue bottles, one original flavor and one vanilla frosting flavor. Both are great to make cocktails with, not so much for drinking straight up. I mixed the vanilla frosting with cola, yum! It would taste great mixed with grenadine...looks like a midnight run to the all-night big box grocery is on the docket after finishing this post! Back to the vodka...the original flavor makes a great vodka gimlet. Three drinks down with 3.5 hours left of National Vodka Day...this mamma is one happy blogger. *I received samples of the products for review. All opinions are my own. All typos are the vodkas' fault! Hello corporate world! I'm back and looking forward to burning the Midnight Oil to close deals, increase shareholder equity, create jobs, and make money. It is official. My days as a stay at home mom are numbered. How does a former career executive turned SAHM get back to work? There is no how-to manual (yet). Learn as I go is the path I am taking. I have been hemming and hawing for almost a year about going back. What do I want to do? Do I want to go Full time? Should I jump into full career mode or job mode? How will this affect my daughter emotionally? How will I handle not being within 15 feet of her at all times? Before the first resume was sent, the logistics of this life change had to be ironed out. Priority One: my daughter. I am blessed to have in-laws close by. The logistic of childcare is taken care of. Priority Two: the dogs. They cannot be left home alone all day for 5 days a week. For this I have a plan. Priority Three: my salary. Anything more than $0 is awesome, but factoring the outside costs of a career creates a bottom line that my salary cannot go below. Priority Four: location. The vicinity of my job search is fixed to a 20 mile radius from my in-laws. Fortunately, they live smack-dab center of the suburban industrial corridor, so I anticipate a shorter commute. THREE YEAR GAP! I have elected to leave off what I have been doing these past 3 years. My hands are in a couple at-home businesses, blogging, and homeschooling, to list just a few. It hurts that I cannot put my proudest accomplishment of being Bianca's Mom full-time on the paper that is the diary of my life success. My at-home businesses are not listed, as of today, to avoid pre-screening purges by generalist recruiters. Listing an at-home business MAY (wrongly) throw up a red flag that I am not 100% committed to a new career. So, not only am I a mother BUT I may have an entrepreneurial desire to be my own boss (which does not bode well when searching for a boss). SEND UP THE WARNING FLARES! "Why have you been out of work for 3 years?" This is the pre-screen interview question I want to answer straightaway. After going on many forums with women asking how to answer, it appears the best reply is "I have been fortunate to have the opportunity to stay home while my child was young." "Since you have kids, will you be calling in sick all the time?" "Are you planning on having more children?" "Are you pregnant now and not showing?" "So, how will your past mommy & me playdates be of any help to us?" "Are there still soap operas on TV during the day?" At the end of the day, it's all about statistical probability. I went there, yes. Sending out resumes is a numbers game. 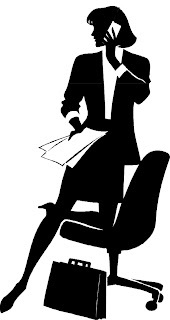 What hampers the process is the time and detail it takes for each cover letter, application, and resume being sent out. I'm talking hours for each position! Cutting out 4-6 hours a day for my career search is tight. I am not willing to take away from my current responsibilities (aka my good work ethic) so sleep looks like the department I will have to make cuts in. If you have any helpful suggestions, corporate connections, or are looking to hire, leave a comment or email me! My daughter has a laptop. It's a hand-me-down, a real old hand-me-down, but it does the job I need it to. Her Caillou Preschool CDs (insert nails screeching down chalkboard here) keep her occupied for at least an hour at a time on the days I need a teacher's assistant. Aside from the few YouTube videos I incorporate with lessons, our school days are uplugged. Reading, Writing, Arithmetic, Grace & Courtesy, Practical Life, and Pretend are all of the utmost importance in my homeschooling approach, so is computer work. Computer learning I angle as a treat for my daughter. Sometimes it helps the day's lessons go by smoother and sometimes it heals a rough day. Either way, she is developing eye-hand coordination and technology navigation which will only help her as she grows into a contributing member of society. How early a child should be exposed to computers, well, is an argument as touchy as breastfeeding. At what age did you start your children using the computer? Snow White & The Huntsman is now available on DVD & Blue Ray Disc. The makings of a perfect low-key get together that can be thrown together within seconds: Yellow Tail Wine (always at least a couple bottles...we finished 3), sweet & salty snacks from The Popcorn Factory, and the obligatory veggie tray to balance out the Good:Evil calorie ratio. "In this spectacular action-adventure, Kristen Stewart (Twilight) is Snow White, the only woman in the land fairer than the evil queen Ravenna (Oscar winner Charlize Theron). Ravenna wants nothing more than to destroy her young rival, but she doesn't know that Snow White has been training in the art of war with a huntsman (Chirs Hemsworth) the queen dispatched to kill her. Together with a handsome prince (Sam Claflin) enchanted by Snow White's beauty and power, they assemble an armed force to recapture the kingdom. This breathtaking new vision of the legendary tale from Joe Roth, the producer of Alice in Wonderland and acclaimed commercial director and state-of-the-art visualist Rupert Sanders is, in the words of Shawn Edwards, Fox-TV, "A film that soars with creativity, stylistic genius and amazing battle scenes." Snow White &The Huntsman is visually stunning. The costumes & sets are extraordinary and the actors...well they are beautiful. Charlize Theron portrays the Evil Queen effortlessly. Kristen Stewart though was a poor choice for Snow White. Of course anyone watching this movie will be comparing it to all Snow White movies ever released as well as the fairy tale read as children. We know Snow White as meek & gentle, with an endearing personality. K Stew's Snow has just a pretty face, void of expression, personality, or chutzpah. I caught myself wanting to fast forward K Stew heavy scenes and yearning for an exclusive twist to the story to make this movie worth watching in its entirety. Mind you, I was full of wine while watching. I will sit down this week to watch the film again, sans booze, to see if my perception of it changes for the better. All in all, the movie is one to see, if just to have more fodder for K Stew, to look at beautiful people, and to have another option for an age old story. Don't let my cattiness be your judge, see for yourself!